It’s easy to understand the importance of lung cancer education and advocacy. Of COURSE we should help patients and caregivers learn more about different types of lung cancer, biomarker testing, and treatment options. Of course we should help them come together, to raise their voices, to make the general public understand the terrible toll lung cancer extracts from individuals and society, to combat stigma and nihilism. 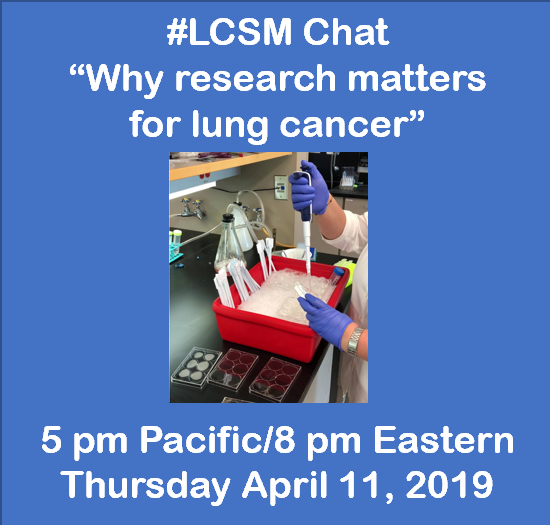 Our April #LCSM Chat will start April 11, 2019 at 8 pm Eastern (5 pm Pacific) and focus on “Why research matters for lung cancer.” The term “research” covers many topics, from discovering the reasons why patients get lung cancer, to investigating how to detect lung cancer earlier, to identifying and refining drug targets, to developing new treatments for lung cancer patients. And research itself covers a broad spectrum, from basic science research, to translational research studies on biological materials from lung cancer patients, to clinical studies on patients themselves. Nothing moves the needle more for lung cancer patients than research. As an example, let’s consider the story of ALK rearranged lung cancer. This molecular rearrangement was first described in lung cancer in 2007. Based upon knowledge of its role in other tumors and based upon laboratory studies of cell lines with ALK rearrangements, an existing drug was hoped to potentially be effective for these patients. Building on what researchers and oncologists had learned from clinical trials in patients with EGFR mutations, prospective clinical trials were able to narrowly focus on patients specifically with ALK rearrangements and to quickly demonstrate the efficacy of that drug. It was approved for patients less than four years later. Today there are many other targeted drugs for ALK rearranged lung cancer patients that work even better. Additionally, tremendous efforts are being made to understand optimal sequencing of these drugs as well as strategies to overcome treatment resistance. This has undoubtedly changed the lives and outlooks of thousands of lung cancer patients. A recent paper reported that at a specialty lung cancer center, the median survival of ALK positive patients was 6.8 years compared to just 9 months for patients without targetable molecular alterations! Such success would have been hard to imagine just ten years ago. Fortunately, the ALK story is not unique. Patients with molecular aberrations in EGFR, ROS1, BRAF, MET, NTRK, and others may experience similar success, thanks in some part to education and advocacy, but particularly driven by research. And research into immunotherapy (which won the Nobel Prize in Physiology or Medicine in 2018) has now opened the door to patients not lucky enough to have these “driver” mutations. Clearly research has changed the face of lung cancer and the lives of many patients diagnosed with this terrible cancer. T1. Is research just for future patients, or do current patients also benefit? T2. In what areas is more research most needed for lung cancer? T3. What can researchers do to make their work more accessible to patients and advocates? T4. What is the @IASLC STARS program and why are programs that train patients and advocates important? T5. How can patients and advocates get more involved with research? 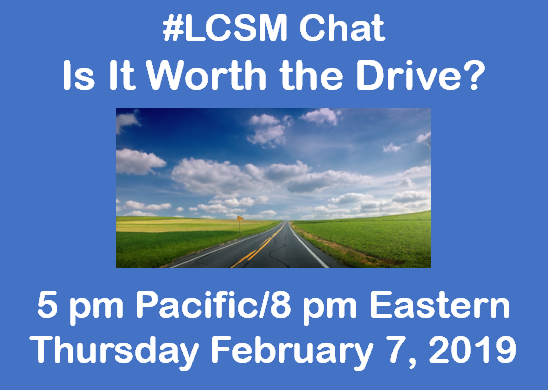 Please remember to include #LCSM in ALL your tweets so the other chat participants can see them. If you need a refresher, read our primer on participating in the chat. Note that some tweetchat apps (like tchat.io) will not display tweets longer than 140 characters. Hope you’ll join us! Diagnosing the type of lung cancer from a tissue or liquid biopsy is absolutely critical to selecting treatment and determining the patient’s prognosis. However, for many lung cancer patients and their families, the role of tumor tissue in their diagnosis is a mystery. What happens to tissue collected in a biopsy? How is it analyzed? What is involved in getting helpful answers from biomarker testing? The specialized doctors responsible for answering these questions are pathologists. They identify any lung cancer cells in the biopsied tissue, and guide the patient’s biomarker testing. Unfortunately, pathologists do not typically speak with patients, so patients and families–and even some doctors–often do not have a clear understanding of the role pathologists play in their diagnosis and treatment. Learning more about the pathologist’s role can help patients and families cut through the hype about biomarker testing and provide a better understanding of the patient’s specific disease. T1: What role does a pathologist play in diagnosing lung cancer? How is a molecular pathologist different from a pathologist? T2: What happens to tumor tissue after a biopsy? T3: How does a pathologist know if a cell is cancerous? How can they tell what type of lung cancer it is (e.g., small cell vs adenocarcinoma)? T4: How does a molecular pathologist decide what biomarker tests to do? 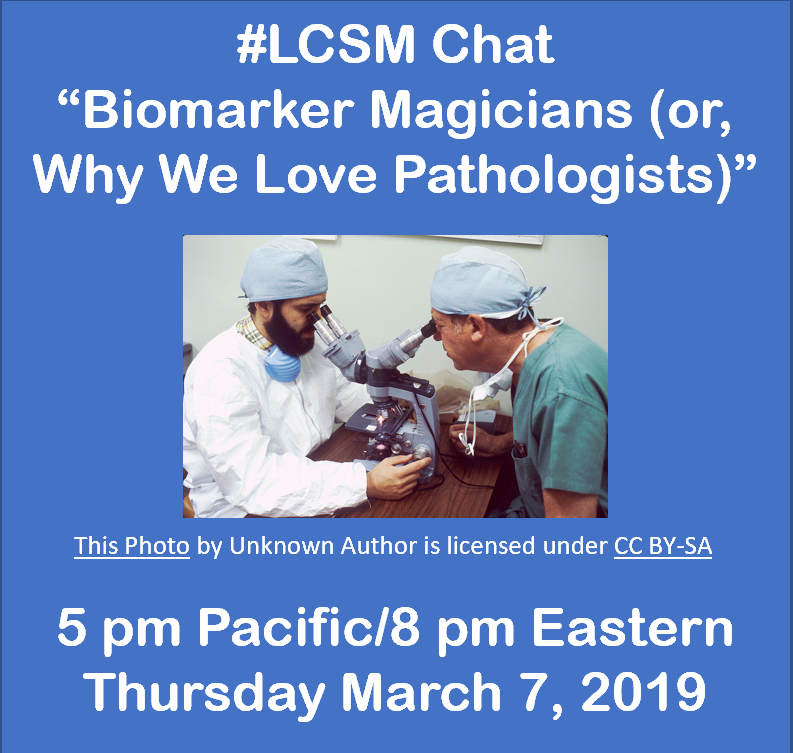 T5: If you have talked to your pathologist, what did you learn? If you haven’t, what would you like to learn?